Stuart Ward and Dani de Waal from the “Once” tour company. That was my first thought after viewing the acclaimed Irish film about two unlikely musical collaborators in hardscrabble Dublin. It struck me as discount mumblecore with a brogue, an impossibly twee story overstuffed with choreographed moments of preciousness. So it was with some trepidation that I walked into Shea’s Performing Arts Center on Tuesday night, when a tour of the insanely popular 2011 musical adaptation opened its six-day run. But after two acts of simple storytelling, expert musicianship and sensitive acting that would put most Broadway productions to shame, I left the theater convinced I’d seen one of the best new musicals of the young century. You’ll want to see “Once,” a beautiful whisper of a show with a see-through soul, at least twice. It’s rare that a Broadway musical does anything other than diminish the Hollywood script it’s based on. But “Once” takes John Carney’s script, strips it to its basic elements and builds it back up into a far more affecting and engrossing story than played out in the 2007 film. That story, in all its beautiful simplicity, revolves around a man and woman (Guy and Girl, played here by the extraordinary Stuart Ward and Dani de Waal) who meet on a Dublin street and carry on a brief but intense musical friendship. Guy’s girlfriend left him half a year ago, and he’s casting about for meaning in his life and struggling to recover his lost confidence. Girl, whose direct manner and severe Czech accent provide much of the humor in the show, slowly but steadily coaxes that buried confidence to the surface. Together, they find a way forward through a shared love of music. If that sounds the slightest bit treacly and contrived, it is. But it hardly matters in this production, which is powered by Enda Walsh’s remarkable book. Walsh’s work, ordinarily dark and brooding, strikes the perfect balance between humor and pathos. Much of the musical consists of Guy and Girl simply sitting next to one another and talking – about their music, their frustrated lives, their musical dreams. They’re surrounded by a small cast, each of whom plays instruments onstage, lending a sense of authenticity to the show that instantly endears it to those who don’t consider themselves musical theater fans. Everything about the production is understated, from Bob Crowley’s gorgeously ramshackle set and costumes to Steven Hoggett’s beautiful choreography and Natasha Katz’s sumptuous lighting. Against such a well-made canvas, this cast paints a beautiful picture of a great musical friendship. There’s not a weak link among them. In addition to Ward and De Waal’s palpable chemistry, we’re treated to Evan Harrington’s comic gifts as the owner of a music shop, Raymond Bakhour’s whisper-quiet compassion as Guy’s father and Donna Garner as Girl’s severe but somehow endearing mother. The whole affair is a love letter to music, to theater and even to Dublin – a gritty city where culture can’t keep from blooming. 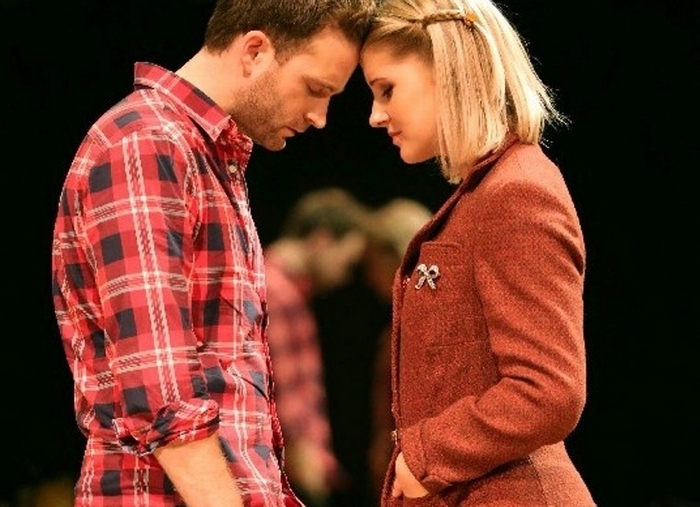 Against the odds, “Once” proves that Broadway’s not a bad place for it either.